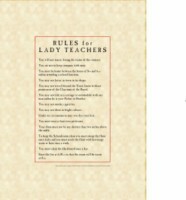 These are rules for Victorian lady teachers and would appear humourous to us today. The facsimile print is supplied with 18mm wide MDF frame with attractive rustic wood finish, and contains acrylic "glass" for safety reasons. On the back of the frame is a strut, so it can be stood on a table, or it can also be hung on a wall. Size 240mm x 335mm.